Photographs of books and manuscripts in Wellcome Library’s collections and images submitted directly to the photo library, Wellcome Images, are regularly featured on television programmes. 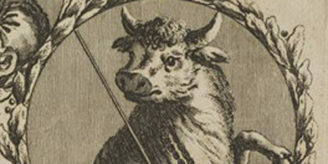 Television viewers might have seen Wellcome Library material without even realising it. Two of these programmes have been nominated for the Association of British Science Writers Awards in the “Best scripted or edited programme” category. The winners will be announced tonight. 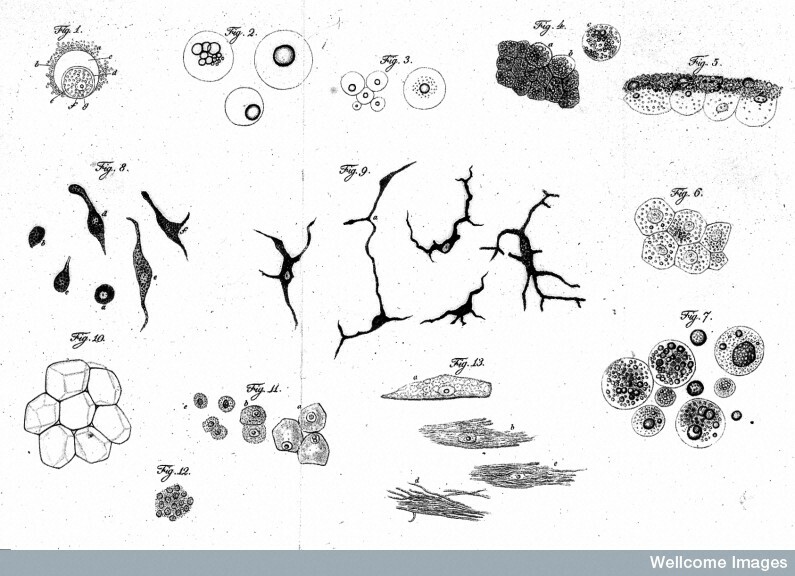 BBC Four’s Cell featured early imaginations of the cell and modern micrographs from Wellcome Images. The drawings shown here are taken from Theodor Schwann’s 1839 “Microscopic Investigations…” and were presented by Dr Adam Rutherford in the first episode of the three-part series. The other nominated television programme, Darwin’s Dangerous Idea on BBC Two used engravings from the Library’s copy of Robert Fitzroy’s “Narratives…” of the Beagle’s voyage. 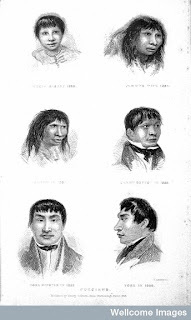 Andrew Marr introduced a group of Tierra del Fuego natives with whom Darwin travelled on the Beagle, each illustrated by a portrait from the page shown here. This year, photographs from Wellcome Images’ clinical collection were used on Channel 4’s Dispatches: Gun Crime to show the real effects of an injury caused by a bullet. 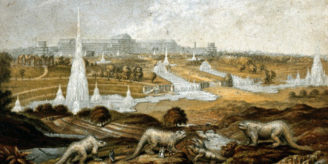 Genius of Britain made use of Sir Christopher Wren’s plan of London as drawn by Gwynn. Back on BBC One, many of our images have been used in the Who Do You Think You Are? series. Most recently, two illustrations of 19th-century East London schools were used in an episode where actor Rupert Everett explored his family history. 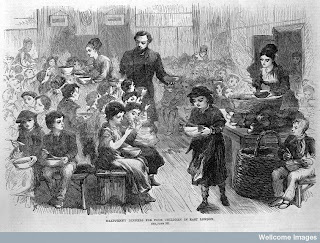 Engravings of London slums were shown in BBC Two’s Victorian Pharmacy this month, which reconstructed life in a 19th-century pharmacy. Many more historical images have been used by the BBC this year in Children of the Revolution; The Story of Science; Victoria: A Royal Love Story; Mapping the World and Jenner’s Marvellous Medicine. It’s not just the small screen where you’ll find our images. Creation, the 2009 film featuring Paul Bettany as Charles Darwin, used some phrenology images as part of the set. Clinical images were provided to the Harry Potter production team, who have used them to recreate wounds in the next instalment of the magical series. Finally, keep your eyes peeled for an eerie photograph from the historical collection appearing in The Awakening, a ghost story due in cinemas next year.